As well as Toyota’s incredibly efficient Hybrid Synergy Drive system, the aerodynamic design of the Toyota Prius also plays a key part in its excellent fuel economy and quiet, peaceful driving experience – it’s no wonder that Toyota’s trail-blazing hybrid maintains its position as the world’s best-selling hybrid. The Toyota Prius is one of the most recognisable cars on the road today – its characteristic, sweeping profile means it’s among just a handful of cars that can be identified from its silhouette alone. But the individual shape isn’t just about making the car stand out. While Prius’ award-winning design embodies Toyota’s universal design philosophy, based on the principles of An Raku Tan (An – reliable and safe; Raku – exciting yet comfortable; Tan – simple and straightforward), its eco focus means great emphasis is also placed on maximising aerodynamic efficiency. Considering that people can find it difficult to walk against a strong headwind, the force of air against a fast-moving car is much stronger and requires careful management to reduce aerodynamic drag. When air hits the front of a car, it bounces off in different directions, causing turbulence and creating unwanted load. Similarly, when rotating tyres enter the air stream, further resistance is caused as the tread and wheel spokes claw at the air and disturb its smooth passage. In other words, the greater the aerodynamic disturbance produced by a car, the less fuel efficient it will be. The design of Prius uses natural aerodynamic ‘carving’ together with special wind-cheating tricks to help it slice through the atmosphere with minimal effort. The relatively small frontal area of Prius, as well as the small upper grille aperture, minimises the initial impact of air, directing its passage over and around the rest of the body rather than attempting to pass through it. A subtle chin spoiler at the bottom of the bumper slices the air heading around the car from that passing underneath, while the flat, vertical surface of the front bumper corners serve to correct the airflow as it passes over the front wheels, minimising turbulence in the wheel arches. 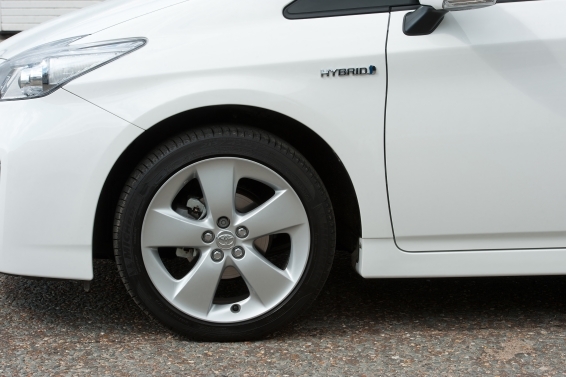 Spats are fitted at the front of each wheel arch to further suppress airflow changes around the tyres, which themselves feature a low rolling resistance compound. Minimal disruption smooths air passage across the rest of the vehicle, thereby reducing drag and improving high-speed stability. The A-pillars are pushed forward to increase the rake of the windscreen, panel gaps are narrow, and the glazing seals are flush with the body. Necessary additions such as the door mirrors, handles, light lenses and rear spoiler are carefully designed to be aerodynamically efficient. Side skirts are used to carve a clear aero demarcation between the outside and underside of the car, directing air to flat vertical surfaces on the rear bumper corners that once again correct airflow and reduce turbulence. Meanwhile, the underside of Prius is comprehensively covered with flat panels to prevent air getting trapped and causing turbulence within pocket-like elements such as the bottom of the engine bay and load-space floor. 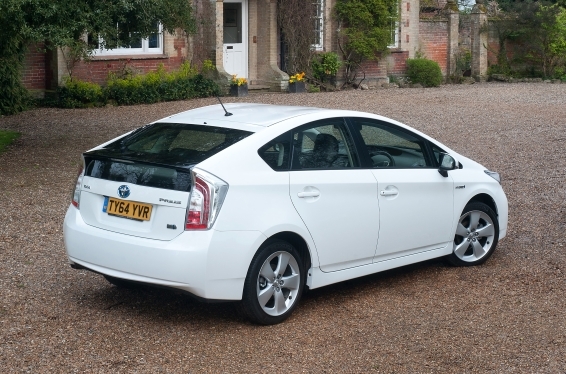 Finally, the distinctive, extended roof line of Prius ends rather abruptly with an upright ‘Kamm effect’ design for the rear end – one of the most efficient means of reducing the low-pressure area of trailing wake pulling on the back of the car. This feature converges the vehicle’s contours into the beginnings of an aero-efficient teardrop shape but abbreviates it at an intermediate point to avoid unnecessary body structure adding to the length and weight of the vehicle. Aerodynamicists have discovered that passing air needs only an initial suggestion of this teardrop shape in order to deliver a large proportion of the turbulence-reducing effect of a full ‘Kammback’ or ‘Kamm tail’ design. The combination of this aerodynamic efficiency with low rolling resistance tyres has helped the third-generation Prius achieve a 14 per cent reduction in CO2 emissions compared to the second generation model. It slips through the air with a remarkable drag coefficient of just Cd 0.25, which has secured its position as the world’s most aerodynamic hatchback as well as one of the most instantly recognisable. 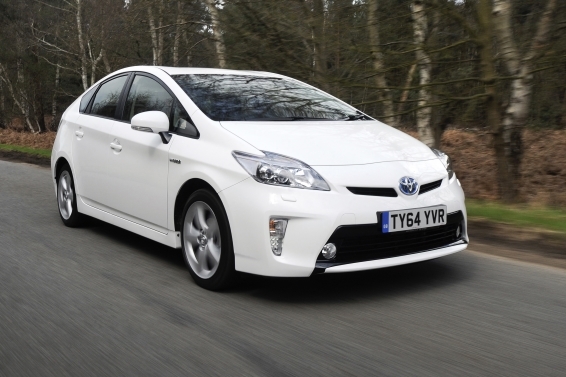 Read more about Prius here, or find out more at the designated section of the Toyota website. I use a toyota chr hybrid as a company car. I looked at the aerodynamics of the hybrids and wondered if there was a low cost way to enhance them. As a simple concept, similar to the way a dolphin uses a slippery skin to reduce drag underwater, would producing a pocket of air around a car reduce the drag on it as the air doesnt hit the vehicle? If a couple of upward pointing nozzles housed in the front bumper directed air around the car when it moved forward, could an airpocket be generated at minimal cost and reduce drag on the car. The idea is to push air away from the surface of the car? Im a layman so excuse me if i missed something basic, but driving a hybrid inspires me to think of ways to contribute positively. Thanks for getting in touch and for your interest in improving Hybrid efficiency. Yes, this technique called air lubrication is used in flat bottomed cargo ships. We are not aware of any applications of the method in the automotive sector, but we appreciate your enthusiasm and thank you for sharing your ideas with us.